London-based artist and chemistry aficionado Aoife van Linden Tol will relocate to facilities in a remote forest area south of Berlin this June to create her newest collection of 'explosive art', detonating small bombs to make imprints on paper, wood and metals. The artist says she is turning bombs from a destructive tool into a force capable of creating beauty, and notes that traditional artistic tools can also be transformed. 'I could kill someone with a pencil if I wanted to,' she adds. Her results will be exhibited later this year at the allgirls international art gallery in Berlin in a show called 'Blowing My Dreams Away'. In 2001, van Linden Tol completed an explosives course at the UK's International School for Security and Explosives Education, and she made her first artworks on the firing ranges of Salisbury Plain, operated by the UK Ministry of Defence. 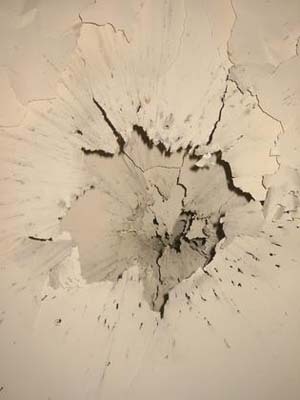 After exhibiting 'Explosions on Paper' in 2006 in Lübeck, Germany, she came to the attention of BAM, according to BAM spokesperson Ulrike Rockland, who until 2006 was a physical chemist in the institute's chemical safety engineering lab. BAM allowed van Linden Tol to use the test site in 2007 to create art objects from newspapers, books, and other paper objects. The results are among the items being exhibited until March 22 at the Brandenburg Art Association in Potsdam, Germany, as part of an 'Art + Science' project. Rockland says that BAM has also contributed four artworks to the exhibit. All four started as flat 40-cm copper plates, but three were subjected to test explosions within BAM's 50 litre, four tonne spherical autoclave, unique in Europe and used for studying reactions of gases under high pressures up to 1,100 bar. The copper plates were used in a series of tests to determine the explosive behaviour of the liquid solvent toluene and pure oxygen at various pressures. Oxygen pressures varied between 8.5 and 21 bar set off explosions that transformed the plates into oyster-shell-like shapes of 'fascinating beauty', says Rockland.